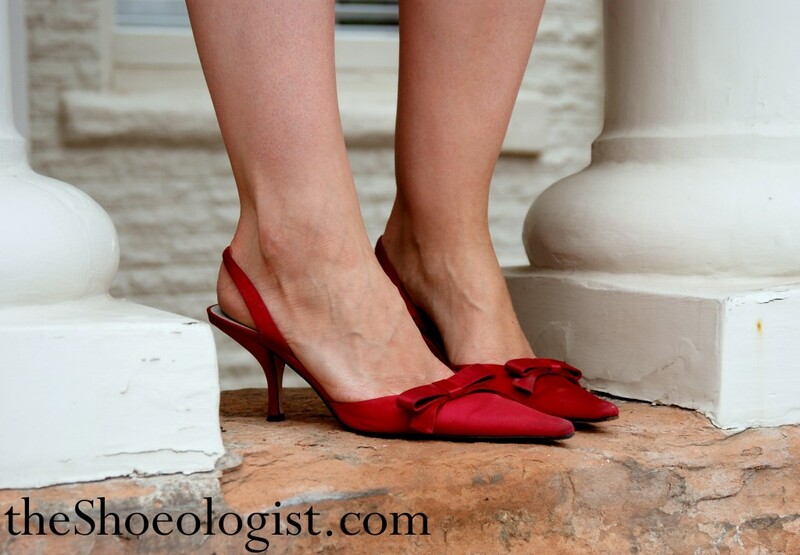 Red satin pointy-toe slingbacks with dainty bows and a demure 2.5-inch heel, by Karen Smith. These are generally categorized as “fancy shoes”, but today feels completely springy and I, for one, would like to celebrate it. With satin slippers. Impractical? Yes. But when have I been known for being practical? Today is the last of the party shoe mini-series, and we are ending on one of my all-time favorite pairs of heels. Click here for the rest of the party shoes. Magenta satin t-strap peep-toe sandals with rosettes and 4-inch heel. I would like you to take a moment to just admire these–they just might be my favorite pair of shoes. I have worn these only a few times–to the symphony, on a fancy date, around in my apartment on a particularly sad day–they never fail to make me feel like a million bucks. I have been touting wearing fancy party shoes with jeans, however these ones must be seen. Please to wear with something that shows a little leg, okay? This week I’m posting all about party shoes, the ones I rarely wear but still are so beautiful I get butterflies in my stomach when I think about them. See here for other party shoe posts. Silver sparkly strappy sandals with 3.5-inch heel and criss-cross straps at the toe. I found these at Nordstrom Rack almost 8 years ago for $35 dollars, marked down from a hundred. They started out at t-strap shoes, but I was in an anti-T-strap phase and clipped it off. (What was I thinking!? I’m glad it was just a phase! I love t-straps!) At any rate, I have worn these to the opera, the ballet, a fancy black-tie party, dancing, (smooching! )…I love them. They go with just about everything and what girl doesn’t need a little sparkle at her feet every so often. Am I right? There are about ten-thousand options around the Interwebs for something sparkly and fantastic, here is a small sampling. Seriously, if you need a little pick-me-up click through these links. So many pretty shoes! criss-cross straps, peep toes and a lot of sparkle! metallic mesh strappy sandal, goodness, these are fancy! Here are a few similar pairs, although nothing quite so outrageous in price. Happy Monday. Chocolatey brown satin strappy sandal with 3-inch heel, from B.P. The last few days it has felt like spring here, it even smells like spring! In fact, my allergies kicked in last week due to a prolonged thaw! Don’t worry, I’m sure it will plummet into sub-zero temperatures and a couple more feet of snow will fall in my valley before too long. But for now I am enjoying the toe-baring weather! Here are a few sassy pairs of satin heels to tide you over until summer (or, if you happen to live somewhere where it’s always 70-degrees and sunny, you can wear them now)(it has not been 70 here, more like 50)(excuse the excessive parentheticals), or if you need to dress up for a fabulous party or swanky event or an otherwise uneventful Tuesday. Ok, I know these next two aren’t strappy or summery or anything–but there is snow in the forecast and these ankle booties just seem so cozy and snuggly! Burgundy patent-leather pointy-toe pumps with bow and fringe at the toe and 3-inch heel, by Anne Klein. I love how classic these heels look, I have worn them with dark, skinny jeans and a white button-up, or a suit, or (like today) a printed dress and cardigan. They go with everything. I tried to find a similar pair of heels, but apparently burgundy patent leather + menswear-inspired pumps are harder to come by than I thought! I did find some lovely burgundy heels though. I have a huge crush on these layered leather platform pumps and wish I had the extra pennies to order them. Ditto on these burgundy patent-leather Mary Jane’s from Joan & David. This pair of pointy-toe pumps from Charles by Charles David are swoontastic, and they have some color combinations that made my jaw drop (I’m looking at you, camel and orange. ) Here is a really cute pair of Menswearish ballet-flat from Chinese Laundry . I also found two pair of fantastic heels made from several different textures in the same, deep burgundy hue; slingbacks from Anne Klein and these day-to-night stunners by Lovely People.